This version is released now to make it more convenient to use LeMedia. Based on previous versions, we add a Addon with GUI named "LeMedia Settings" in LeMedia_v1504, and this Addon is similar to "RaspBMC Settings". 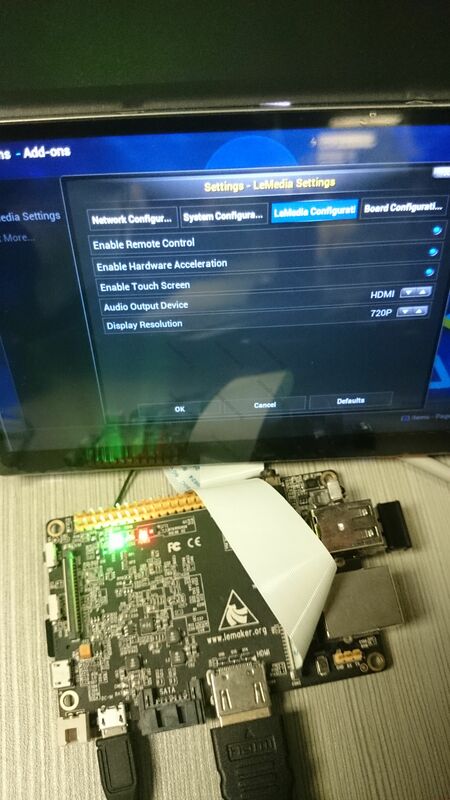 With the help of "LeMedia Settings", this version of LeMedia supports both Banana Pi and Banana Pro. More details please refer to information below and welcome to use LeMedia_v1504. Attention: This version can support both Banana Pi and Pro, but the LeMedia image is set to support Pro by default. After boot on Banana Pro, you can set LeMedia to support Banana Pi using the "LeMedia Settings". If you only have a Banana Pi, you can follow the guide at the bottom of this release note to choose the version of your board. 1. Based on minimal Debian wheezy. 2. XBMC build from xbmc_Gotham_A10: https://github.com/warped-rudi/xbmc.git . 14. Add a Addon named "LeMedia Settings" to configure LeMedia. With "RaspBMC Settings" as reference, we add "LeMedia Settings" in this version. Using this addon, you can make some configurations through graphical interfaces instead of typing commands. For example, you can configure networks, hardware acceleration, audio output device, samba service, choose the board version and screen types, reboot or shutdown without exit XBMC, and so on. Any other good featrues can be added to "LeMedia Settings" if you advise. You can find this addon in "Programs" of XBMC. As described in previous versions , LeMedia is not perfect with HW-ACC, but it can surely support 1080P and 720P videos whose format are like these: http://linux-sunxi.org/CedarX/VideoRenderingChart . I'm sorry you have to convert your videos to these formats. If you have some videos that LeMedia can not play, maybe you can disable the HW-ACC in "LeMedia Settings" to try to play again. You can use commands just described in the release new of LeMedia v1.1 to configure wireless network. Now, we provide a graphical way to connect WIFI. Go to "Network Configuration" in LeMedia Settings, just input your wifi name and password, then click the button to connect. This way need reboot to make it take effect. If you don't need to use one of eth0 or wlan0 ,you can comment the part of eth0 or wlan0 in "/etc/network/interfaces", it will save your time when boot. 4. About the Display Problem. Sometimes when you exit XBMC to go to debian system, you may find the screen is remain black. This is a bug and we are sorry about it. If you are using HDMI screen, then you can unplug your HDMI cable from Banana Pi/Pro board and plug it into the board again, you will see the console eventually. But if you are using LVDS interface (such as LeMaker touch screen), there is no easy way to get back from black screen! How To Choose The Version Of Your Board (Pi or Pro). If you are using Banana Pro, please skip this guide. In this part, we will show you how to boot the LeMedia v1504 image on Banana Pi, and you only need to type three commands. Please make sure that your host system is Ubuntu or other Linux distro. for example, my card is mounted at "/dev/sdc", please remember the "sdc". Let me explain the script parameters. (2) the second parameter: [0 | 35 | 5 | 7], means the screen type, 0 is HDMI screen, 35 is 3.5 inch LVDS screen, 5 is 5 inch LVDS screen, 7 is 7 inch LVDS screen. You can only use these four numbers. (3) the third parameter: [sdb | sdc | sdd], means where your SD card is mounted on host system, like "sdc" in the example above. Now, you can boot LeMedia v1504 on Banana Pi/Pro. tv recognizes signal (hdmi), but i only see a black screen. waiting +5min, nothing shows up on the network (connectet with cable). I have also only a black screen. I have the same problem " Black screen" on Bananapi not Pro. enjoy to this version ! How can I do that. Is the device booted and available via ssh console? Before I renew my v1.1 installation it's good to know the howto. You must modify SD card on your host system. I do that on my ubuntu. it is not possible to do via SSH because at the boot time the network bug on WIFI.